Birthdate / Birthday / Age 17th AUGUST, 1982. At the time of updating this article in 2018, her age was around 36 years. Marriage & Wedding / Husband / Spouse Currently Married. Her husband’s name is Sameer Wankhede. He is an IPS officer. The wedding took place on 29th March 2017. ☞ Kranti Redkar was born and brought up in Mumbai. ☞ Initially, she was not interested in entering the world of acting, but later when she received offers for commercial plays, she started thinking seriously about this field. ☞ Sun Asavi Ashi was her debut Marathi film, but got her first round of true success in the song [Kombdi palali] in the movie Jatra, with Bharat Jadhav. 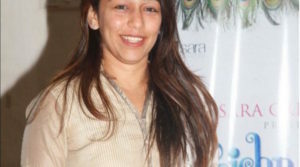 ☞ She also has done a couple of Hindi series “Chittod ki Rani” and “Simply Sapne”. Her small role in Prakash Jha directed movie Gangajal was well noticed. ☞ In 2013, she was also engrossed in Match Fixing controversy. Later, she filed a defamation suit against the TV channel who had linked her in this scandal. ☞ She also made her debut as a director with the movie Kaakan. She also has written two songs for the same movie. ☞ An excellent dancer, Kranti has performed in a number of award functions and other stage shows. ☞ Her height is around 5 feet 4 inches. you are the best in acting. your height and smile mast………. You are awesome……I like acting, dancing and your cute smile. ashich aayushat pragati karat raha and keep smiling always!!! !